Textbook definitions of "fossil" all converge on some variant of "any sign or indication of ancient life". This covers a lot of territory, from bones and seashells, to chunks of wood and leaf impressions, to worm burrows and animal footprints. Globs of feces count as fossils, if they are old enough. Fossils often are found enclosed in sedimentary rocks (sandstone, limestone, shale, etc. ); if instead of being lodged in the rock they are found lying on the surface of the ground they often can be assumed to have come from whatever sedimentary rock formation happens to be located nearby. (But not always; clearly under some circumstances fossils can be transported a long way from where they were originally buried. Ancient or modern streams are often involved). In the Park many of our older sedimentary formations contain shells (clams, snails, etc. ), suggesting a marine or lacustrine (lake) environment; younger rocks carry bones of land vertebrates, pointing to a profound change in topography and climate. These younger rocks also retain footprints of interesting land animals, most of which are now absent from the Park. Fossil wood is common. No dinosaurs, though - our rocks are too young. You might reasonably ask how old a thing must be before it can be labeled a "fossil". There is no hard-and-fast rule; butclearly anything more than a few thousand years old is a legitimate fossil. Paleontology professors have been known to say that "if it stinks, it belongs to biology; if not, it's ours". Obviously this doesn't work very well for seashells or leaf impressions. As members of the PS we learn how to make this distinction (fossil/not-fossil) using tests involving matches, our noses and/or our tongues. (Refer to the course notes for the fascinating details.) Fossils are known from elsewhere that are as much as 3.5 billion years. (These are stromatolites, essentially very slow-growing colonies of blue-green algae.) Our Park fossils are very much more complicated biologically than these earliest fossils, and very, very much younger; all are less than about 20 million years. 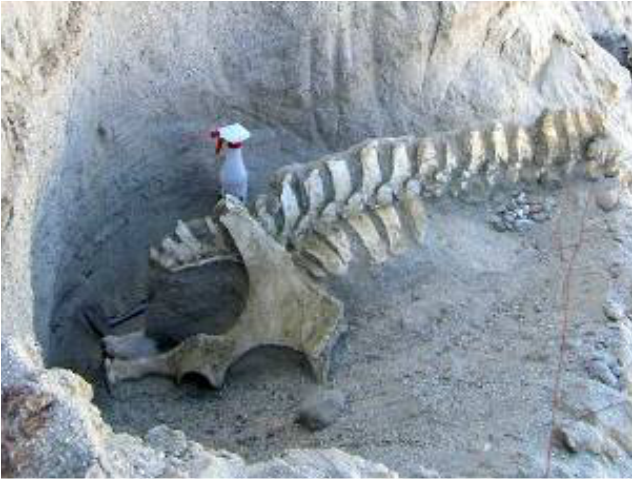 Our much-prized large vertebrate remains date from only the last few million years. So what then does the common term "to fossilize" mean? As ordinarily used it applies mainly to bones and "petrified wood". In this sense the process of "fossilization" implies an extremely slow molecule-by-molecule replacement of the original material of the bone or tree-fragment by inorganic minerals derived from groundwater. Thus, for instance, much petrified wood now consists of silica (SiO2), with none of the original organic material remaining - although the process of replacement may leave the internal structures of the wood intact and easily recognizable. To fossilize in this sense requires a very long time, as well as a "matrix" (the rock containing the fossil) that will permit mineral-carrying groundwater to pass through it. This in turn requires holes between the grains composing the rock (called pore spaces) that interconnect, giving the rock "permeability". Many Park sedimentary rocks have ample porosity and permeability, but have not been exposed to mineral-charged groundwater. Also, many of our fossil bones are so young that the time factor comes into play. Thus most Park fossils are not "fossilized"; rather, they consist of the original material itself, in many cases badly weakened and corroded. Collecting and preserving such objects - still fossils, whether "fossilized" or not - provides an abundance of interesting challenges.